Using a pillowcase for sewing up a quick skirt is a great idea, because bed sheets and pillowcases are usually made from permanent press fabrics that seldom wrinkle. 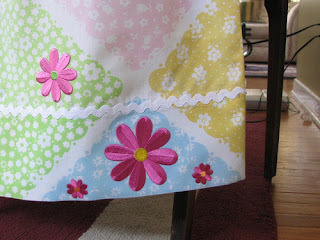 And a pillowcase skirt is an easy sewing project, too. First, find a pillowcase made with fabric you really like. Places to find pillowcases are flea markets, yard sales, garage sales, or even your own linen closet. If you are a too big to make a skirt with just one pillowcase (like me), then use two. The hem and side seams are already done for you, so all you have to do is sew a casing and insert some elastic. Carefully rip out the seam at the end of the case. Turn the edge down ½ inch and press. Turn the pressed seam down 1 ¼ inches and stitch close to the pressed edge, leaving about two inches open for the elastic insertion. Measure a piece of one-inch-wide elastic to your waist size plus one inch. Thread the elastic through the casing, overlap the ends by 1 inch, and sew the elastic ends together. Stretch the elastic to pull it inside the casing. Stitch the casing closed. Smooth the gathers evenly around the elastic, then stitch across the casing from top to bottom at the seam, and then again at each side to prevent the elastic from rolling inside the casing. Press your new pillowcase skirt, and you are done. To make a larger skirt using two pillowcases, open the side and bottom seams. With right sides of the two pillowcases together, sew the side seams, then use the instructions above to create the elastic casing. If you have two pillowcases and do not need them both for the skirt, you can add a ruffle to the bottom of the skirt. To do this, open the side and end seams of the second pillowcase. Cut off the hem at the stitching. Cut the case into four even length strips the across the width of the case fabric. Sew the four strips end to end, right sides together, making a circle of fabric. Iron the seams open. Turn under one edge and make a 5/8 inch hem, and iron the hem. To add the ruffle, cut the hem off the skirt made from the first pillowcase at the stitching. Gather the ruffle to the skirt, with one full panel width to ¼ of the skirt. Stitch the ruffle onto the skirt, press the seam toward the top of the skirt. On the outside of the skirt, top stitch ½ inch from the seam on the skirt side of the seam. This will prevent rolling and will help reduce raveling, too. If desired, use the two hem pieces to make fabric hair bows or scrunchies to match your new pillowcase skirt. To make the skirt uniquely yours, add lace, rickrack, or other embellishment to the skirt. Sew the embellishment over the top of the hem line at the bottom of the skirt if there is no ruffle. For skirts with a ruffle, sew the embellishment just over the seam line where the ruffle is attached, as it shows in the image at top.